Joseph L. Edmonds, joined Children’s ENT of Houston in October 2000. 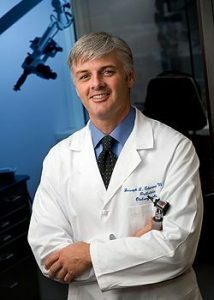 Following completion of his medical education at the University of Kansas School of Medicine, Dr. Edmonds continued his otolaryngology residency training at that institution. He completed a two-year pediatric otolaryngology fellowship at Children’s Hospital of San Diego in California in June of 2000. Here he was exposed to many patients with lymphatic malformations, and developed a special interest in care of these special patients. Dr. Edmonds is certified by the American Board of Otolaryngology and is a member of the American Academy of Otolaryngology-Head and Neck Surgery. He is a fellow in the American Academy of Pediatrics and the American College of Surgeons. He is a clinical assistant professor on the faculty of Baylor College of Medicine, Department of Otolaryngology-Head and Neck Surgery, and Division of Plastic Surgery. Dr. Edmonds became a partner at Texas Ear, Nose & Throat Consultants, PLLC in 2002.